A polymer is a substance of high average relative formula mass, made up of small repeating units called monomers. 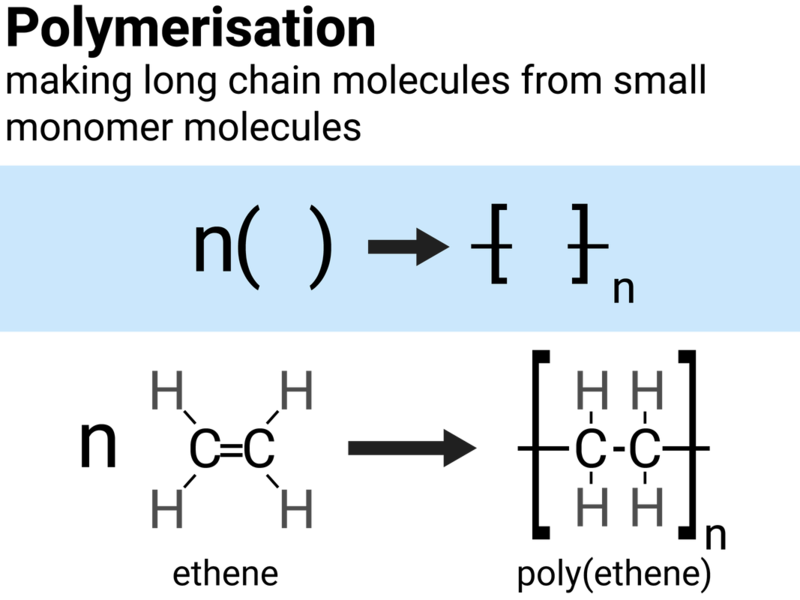 Ethene molecules can combine together in a polymerisation reaction to make poly(ethene). This type of reaction is called addition polymerisation, as we are adding lots of the same monomer together to make one product. The C=C double bond in ethene breaks open to allow ethene molecules to join together. We don't waste our time drawing out a whole polymer chain, as it contains far too many atoms. Instead, we show the structure of the repeating unit. When we draw an equation to show an addition polymerisation, it is important that we write n next to both the monomer and the polymer to show large numbers of each are made. We must also draw square brackets around the polymer structure. Biological polymers are made naturally by living organisms. DNA encodes genetic instructions for the development and functioning of living organisms and viruses. Most DNA molecules are two polymer chains, made from four different monomers called nucleotides, in the form of a double helix. These polymer chains join together in the shape of a double helix. Each nucleotide is made of a sugar molecule, a base (A, C, T or G), and a phosphate group. Proteins are another example of polymers. There are 21 different amino acids that can be arranged to make proteins we need to survive. Many proteins are enzymes, and/or are essential to our biological functions. Amino acids have two different functional groups in a molecule. 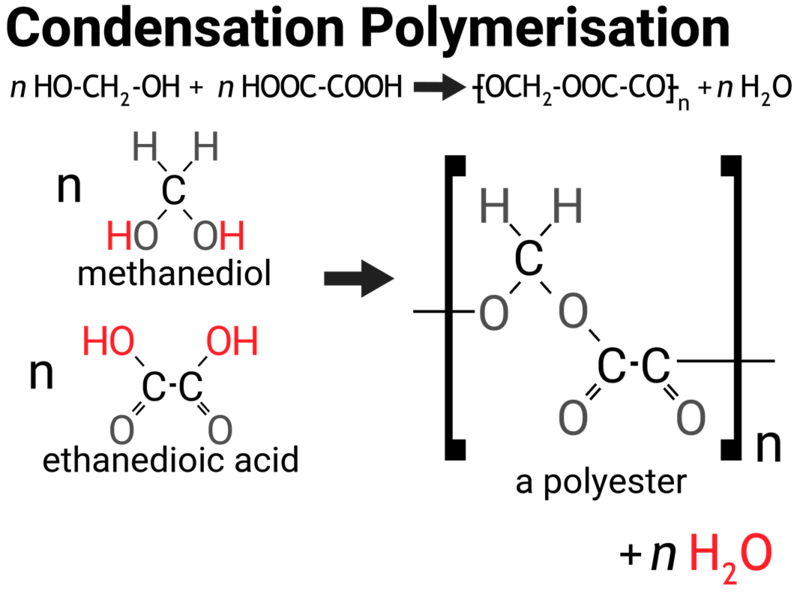 Amino acids react by condensation polymerisation to produce polypeptides. 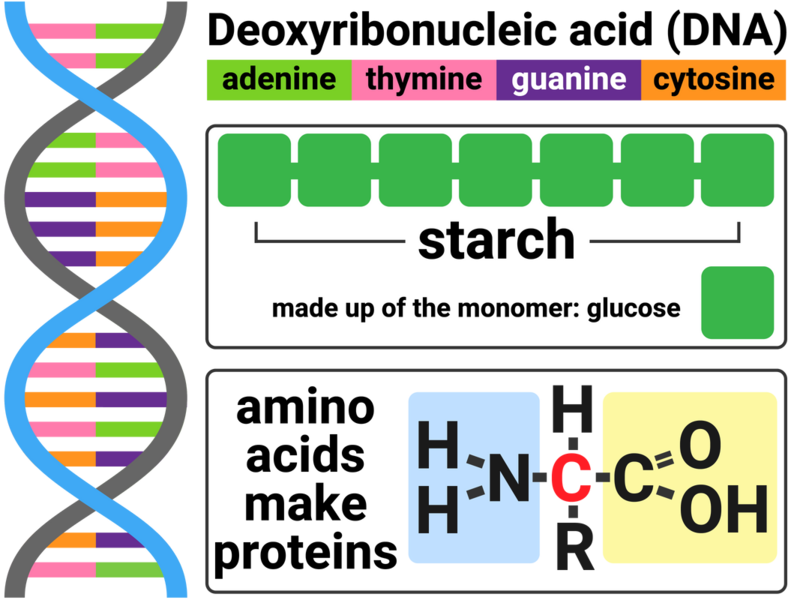 Different amino acids can be combined in the same chain to produce proteins. Methyl ethanoate is an ester. For every one ester molecule made, there is a water molecule formed.